UTM parameters are specials tags added to URLs to help you track and identify where your site traffic comes from or which of your campaigns drives the most traffic. These parameters can be parsed by most analytics tools, such as Google Analytics or Adobe Omniture/Analytics. Setting UTM at your business configuration on Localistico will allow you to modify the publication process of your profile and website links, on the different platforms where your location data is published, allowing you to use your existing tools to track and analyze web traffic generated by each of the platforms. 1. Go to your settings tab Advance Settings and click on the option UTM parameters. 2. Choose the ones that better fit your needs, there are five types of UTM that you can use and customize. UTM Source (required): Identifies the source of your traffic. UTM Medium: Identifies the type of link that was used. UTM Campaign: Identifies a strategic campaign or promotion. UTM Term: Identifies the keywords search terms. UTM Content: Identifies specific links or ads inside a campaign. For example, a click on the "website" link from google maps can be tracked separately to the reservation link. This type of parameters is often used for A/B testing and content-targeted ads. One possible example is setting this to "publisher link" to make different types of links have separate ids. Please note that not all platforms have different types of links, so values will only be different from those that have them (like Google). Service name: the service/platform where the link was published (eg: 'google' or 'facebook'). Business name: the name of the business as specified in your business settings. Venue name: the name of your venue as specified in the Venue settings - please note these may be changed so we recommend using venue ID instead. Venue ID: the localistico identifier for each venue (doesn't change). External location ID: the user-given identifier you entered in the venue settings (if any). Publisher link: for platforms that support multiple links, each type will come identified with a different string for publisher link. Custom text: allows you to enter your own text, that would be used across all venues/platforms for this field. UTM Source: Service name, to know the referrer of the click (Google, Facebook, Foursquare, etc.). 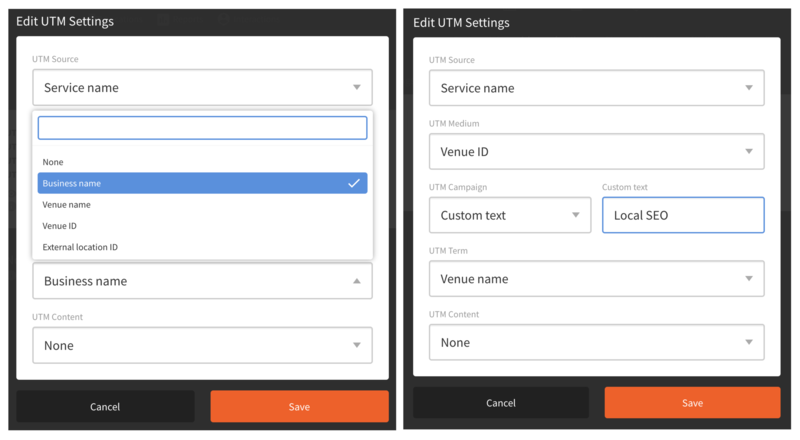 UTM Medium: Venue ID, to know the specific venue that you are tracking. UTM Content: Publisher link, so you can see sources of traffic for platforms that support more than one type of link, like google.